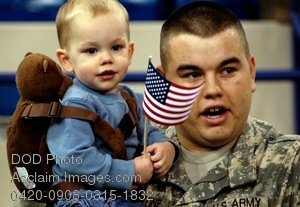 Description: Free, public domain image: Army Soldier Holding His Son at Departure Ceremony. An Army Soldier holds his son during the 76th Brigade Combat Team's departure ceremony at the RCA Dome in Indianapolis, Ind., Jan. 2, 2008. With more than 3,400 Soldiers from approximately 30 Indiana communities deploying for a 12-month tour in Iraq, this is the largest Indiana National Guard deployment since World War II. (U.S. Army photo by Sgt. 1st Class Peter Eustaquio).